November 16, 2018 – Taipei: The 11th edition of Taipei Biennial will open to the public from November 17, 2018 at the Taipei Fine Arts Museum (TFAM), where an international list of 42 individual and group participants from 19 countries and territories will be present until the exhibition closes on March 10, 2019. The first segment of the biennial’s talks programme will be held between November 17-18, inviting internationally acclaimed speakers to explore sub-themes of ‘Re-naturalizing Citizenship,’ ‘Democratizing Boundaries’ and more. Co-curated by Mali WU and Francesco MANACORDA, with the title Post-Nature—A Museum as an Ecosystem, the biennial will focus on the interconnectivity of ecosystemic structures formed between humans and nature and aims to serve as a platform for social experimentation, and the generation of new interdisciplinary possibilities for long-lasting, community-driven, bottom-up synergies. To achieve this core curatorial vision, the two curators have invited a diversified lineup of participants, ranging from visual artists, architects, video workers to non-profit organizations (NGOs) and social activists amongst others, to create a cross-disciplinary discourse in response to the theme of the biennial. For the biennial this year, co-curator Mali WU explains that the two curators have adopted a "creative practitioners" approach to select each individual and group participant, and also the final presentation plans. Participants at the biennial are not only confined to those at the exhibition site, but also – as the co-curators believe – to the speakers as well as the public participants at “eco-lab” who altogether undertake a creative yet pragmatist role to tackle the subject at hand. The robust lineup of participants for the 2018 edition of Taipei Biennale brings intrinsically stimulating projects that allude to the relationship between human and environmental ecology. Under the thematics of "Post-Nature" and the "Ecosystem", the works investigate the impact of foreign species on local ecology, environmental issues such as land and air pollution, as well as climate and environmental change. 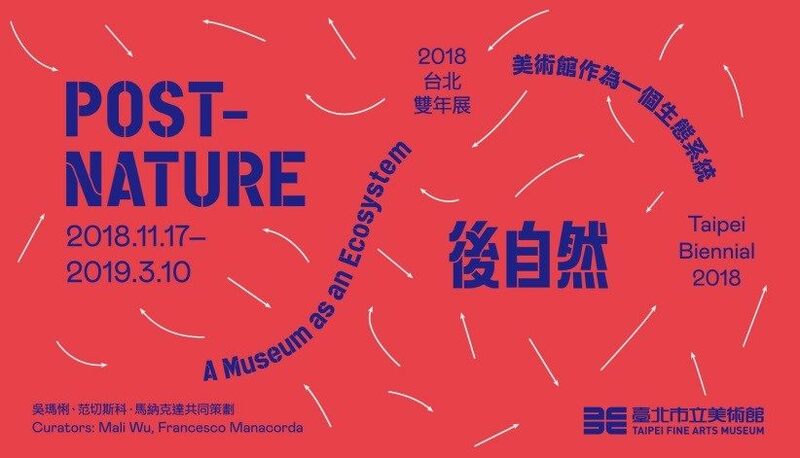 A wide array of topics will be presented in the exhibition hall to invite an open dialogue, allowing the museum to serve as a platform encouraging discussion and exchange of ideas, and directly respond to the curatorial proposition of "a museum as an ecosystem". Highlight presentations in this Taipei Biennial include Anthropocene, 2018, created by Ruangsak ANUWATWIMON (1975, Thailand). Anthropocene is a rolling landscape comprising twenty delicately-colored overlapping mounds of polluted soil, collected from sites across Taiwan. Although human civilization is less than a million years old, our chemical residues are deeply deposited throughout the Earth’s soil horizons, where they will remain indefinitely. The artist hopes to explore issues of ethics and human morality regarding regional land through this artwork. and encourage wiser and more positive human environmental action. AU Sow-Yee (1978, Malaysia) will exhibit A Love Story of Life and Death: Coconut Forest, Belle of Penang, and Intelligence Agent, 2018, a three-channel video and sound installation. Designed as a film set which humorously mimics the Southern Pavilion from the 1935 Taiwan Exposition, the film charts Taiwan’s colonial history through an unlikely romance between a missing intelligence agent and the ‘Belle of Penang’ (Bin Cheng Yan). In the early twentieth century, the imperial Japanese government attempted to transform northern South Taiwan into a ‘paradise’, as a way of providing a test case for further expansion into Southeast Asia in the future. A theatrical murder mystery of sorts, this performative installation invites viewers to reimagine the relationships between Japan, Taiwan, and Malaysia, exposed through their political and botanical connections. Laila Chin-Hui FAN (1965, Taiwan) has been recording natural soundscapes since the age of 7, and has dedicated her practice to developing more sensitive and representative methods of listening to the land. In 2013, she launched the Silent Trail Project which promotes the safeguarding of natural soundscapes. For this Taipei Biennial edition, Chin-Hui FAN has designed Yuanshan Sound Walk, a sensory experience, guided by the artist herself, along the path of Scenery Near Yuanshan, a painting created in 1928 by Taiwanese artist, KUO Hsueh-Hu. During this walk, Chin-Hui Fan intends to arouse the participants’ sense of hearing in order to facilitate a better understand of environmental changes through sound. La Charada China, 2018 created by Candice LIN (1979, USA), focuses on how plants are entangled with human lives. Cultivating the growth of poppy flower, sugarcane, and poisonous plants from the Caribbean, as well as an anthropomorphic-shaped mound composed of red clay and guano stamped into the earth, are central to this installation. During the course of the exhibition, the daily act of caretaking and watering required to encourage these plants to emerge from the earthen body, traces how historically, addiction to the opium poppy was weaponized and used biopolitically by Europeans to manipulate trade advantages. Using such a notion as a framework, this installation spawns references to contemporary crises of human trafficking, forced labor and migration. Vivian Suter (1949, Argentina) lives and works in the southwestern Guatemalan Highlands. Suter’s practice is situated very much between the inside and the outdoors, with works that start in the studio, and completed with natural elements, including rain, wind, mud, plants and insects. Instead of pictorial landscapes or illustrative portraits of nature, Suter’s works are intuitive emotional responses to her immediate surroundings, and therefore profoundly shaped by both the changing seasons and independent upheavals in her environment. For Taipei Biennial, Suter has developed a new series of paintings, produced over a period of days, at a tea plantation in the Lala Mountain of Taiwan. Having never visited Taiwan before, the artist has decided to make her work in situ in order to dislocate herself from her studio in Guatemala and to incorporate her first impressions of the Taiwanese landscape into the work. Mycelium Network Society (MNS) is a collective artist project endeavoring to investigate the unique abilities of mycelium, a collective name given to thread-like networks of fungal cells which share and process information. For this occasion, MNS has developed a functioning model of a mycelium network which demonstrates its innate capacity to relay information, working in symbiosis with all other roots and plants. Following the molecular structure of Patulin, a toxic substance produced by fungus, this installation takes the form of 17 transparent acrylic atoms containing growing Ganoderma lucidum mycelium, and a series of custom-made sensors, transmitters and receivers. These electronic devices detect changes within the living mycelial atoms and transmit this information across radio frequencies, which spatializes the experience as audio within the installation. In a new iteration of Henrik HÅKANSSON’s (1968, Sweden) ongoing work at the entrance of Taipei Fine Arts Museum, Inverted Tree (Reflected), the artist has suspended a local tree, upside down. Hovering unnaturally above the floor, objectified, the tree has become a sculpture; here, the artist appropriates the Duchampian concept of transferring non-art into art space. With its branches reflected endlessly in mirrors above and below its crown, the tree becomes a synecdoche for all plants, as well as the human relationship to and exploitation of nature. HÅKANSSON and MANACORDA both mention that the formal quality of “Inverted Tree (Reflected)” on one hand experiments with alternative ways of representing nature, on the other hand multiplies the environment that any tree may commonly be represented, from form, spiritual to symbolic values. Such augmented environment renders a state of fragility, therefore unequivocally putting its survival at an inevitable risk of disappearing. In the infinity room created by the double mirrors, dichotomies such as life and death, concreteness and abstraction, structure and chaos are shown as continuous rather than forever irreconcilable. Founded in 2006, Taiwan Thousand Miles Trail Association is dedicated to the preservation of the natural beauty and cultural heritage of Taiwan through a network of hiking trails around the island. For Taipei Biennial, the Association will exhibit the research that they have accumulated over the years, showcasing their plans for the future, and also hosting walks and seminars throughout the duration of the exhibition. Three walking tours will be organized in December including ‘From Kuo Hsueh-Hu’s Scenery Near Yuanshan (1928) to ‘There’s Paradise in Yuanshan’(1987)’ which will explore Jiantanshan Trail and Yuanshan Water Shrine Walk; ‘Rescue the Urban Natural Island’ which will go through Jingmeishan Xianjiyan Coast Guard Administration Section of Eco-Craft Trail Walk and ‘Enter Taipei City through Century-Old Danlan Trail’ which will go from Fuzhoushan to Zhongpushan Walk. Ruangsak ANUWATWIMON, Martha ATIENZA, AU Sow-Yee, Ursula BIEMANN, Alexey BULDAKOV, Huai-Wen CHANG + MAS (Micro Architecture Studio), Ting-Tong CHANG, Jui-Kuang CHAO + Tainan Community University, Julian CHARRIÈRE, CHEN Chu-Yin+Solar Insects Vivarium Workshop, Lucy DAVIS, ET@T, Laila Chin-Hui FAN, Futurefarmers, Tue GREENFORT, Ingo GÜNTHER, GUSTAFSSON & HAAPOJA, Henrik HÅKANSSON, Helen Mayer HARRISON & Newton HARRISON, Jeffrey HOU & Dorothy TANG, HSIAO Sheng-Chien, HUANG Hsin-Yao, Indigenous Justice Classroom, KE Chin-Yuan + “Our Island”, KHVAY Samnang, Kuroshio Ocean Education Foundation, Candice LIN, Zo LIN—Weed Day, Duane LINKLATER, LU Ji-Ying, Nicholas MANGAN, Jumana MANNA, Mycelium Network Society (Franz XAVER + Taro + Martin HOWSE + Shu Lea CHEANG + global network nodes), Open Green, Allan SEKULA, Rachel SUSSMAN, Vivian SUTER, Keelong River Watch Union, Taiwan Thousand Miles Trail Association, WU Ming-Yi, Robert ZHAO Renhui, and ZHENG Bo (listed in alphabetical order by surname).